If you ate leftovers for breakfast, lunch, and dinner, there's no doubt that today is the day after Thanksgiving. I hosted Thanksgiving this year and these are my notes to remember what worked and what didn't. For future reference. You know. In general, I was very happy with how Thanksgiving turned out. It was a lot of work (isn't everything a lot of work when you have small kids running around? ), but the food was good (if I do say so myself) and I didn't forget anything. However, it was--oh--just a tad stressful to have Thanksgiving coming on top of everything that's been going on around here: Mike's mom visiting, yard and fence work coordination, NaBloPoMo, NaNoWriMo, other writing work, etc. Don't get me wrong; I like stress and deadlines. I don't know if I'm an official Type A, but I do know that working hard keeps my blood pumping and I like that. But after waking up today and working like a mad woman to finish my mothers club newsletter, then taking the kids to the post office to get passports, I came home, collapsed on the couch, and took a four hour nap. I like my downtime, too. Here's my Thanksgiving brain dump. In case you're curious, Jennie blogged the menu. Outsourcing the turkey, gravy, cranberry sauce, and pies, and only cooking the side dishes at home was smart. We got the turkey, gravy, and cranberry sauce from Whole Foods and the pies from Baker's Square. Everything was excellent. My favorite dish was the Creamy Brussels Sprouts. I found the recipe in the November issue of Better Homes and Gardens magazine and have included it at the end of this post. Yum! Jennie's favorite dish was the sweet potato casserole. I cheated and made Stove Top stuffing instead of homemade and I don't regret it one bit. It's good stuffing. This is the first year we had a separate table for the kids. It worked fine and it was nice being able to set the adult table without using any plastic plates or sippy cups. I made sure to have a new set of plastic containers on hand so it was easy to get together a bag of leftovers for our guests. It's very difficult to coordinate the making of four side dishes without a double oven or a warming area. I have to work on this aspect of dinner to avoid serving cold side dishes. I started cooking too late in the day. 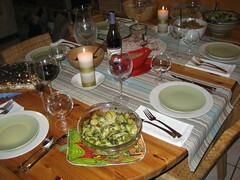 Next year I will have all of the side dishes cooked and in baking dishes well before the guests arrive. Then I will warm up some in the microwave and others in the oven. Note to self: marshmallow topping only takes SECONDS to brown under a broiler. I barely saved the sweet potatoes this year -- the topping looks burnt in the photos, but it tasted good, like a campfire marshmallow. The turkey was Diestal Ranch free-range, and we ordered it smoked (instead of roasted). It was really good. The kids enjoyed it, too. Click to see more photos from Thanksgiving 2006! For a green bean side dish, substitute 2 pounds of green beans for the Brussels sprouts, and reduce the baking time to 15 to 18 minutes. 1. Preheat oven to 350°F. Lightly coat a 1 1/2-quart oval gratin baking dish or baking dish with nonstick cooking spray. 2. In a 12-inch skillet cook onion and garlic in butter over medium heat for 3 minutes or until softened. 3. Stir in Brussels sprouts and thyme. Cook for 4 minutes or until onions begin to brown. 4. Add broth. Bring to boiling. Cook, stirring occasionally, for 3 to 4 minutes or until broth is nearly evaporated. 5. Add whipping cream and nutmeg. Cook for 4 minutes or until mixture begins to thicken. 6. Transfer to prepared baking dish. Stir in half of the cheese, all of the salt, and pepper. Sprinkle with remaining cheese. 7. Bake, uncovered, 20 to 25 minutes or until Brussels sprouts are tender.